Nassau -- The second annual Popeyes Bahamas Bowl was a tremendous success and Bahamas Ministry of Tourism officials are excited about the immeasurable exposure it will bring the Islands of The Bahamas. It was a hard fought battle between the Western Michigan Broncos and the Middle Tennessee Blue Raiders at the Thomas A. Robinson Stadium in New Providence on Christmas Eve. But in the end, the Broncos were victorious with a 45-31 win. 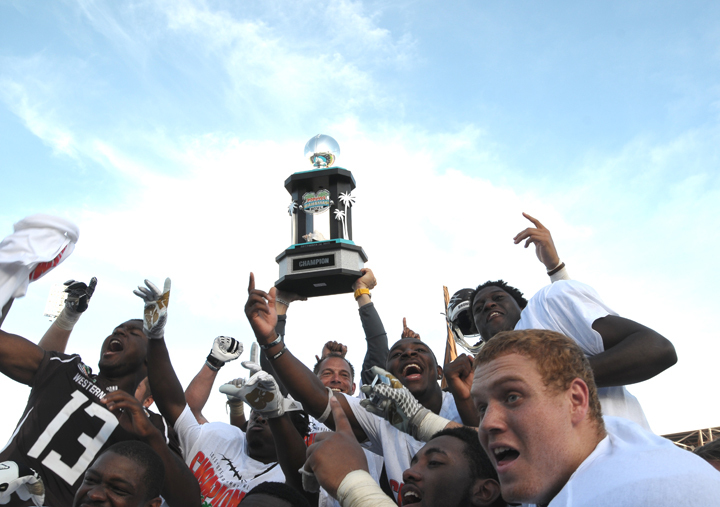 The win gave Western Michigan its first bowl victory in the school’s history and its second straight season with eight or more wins. 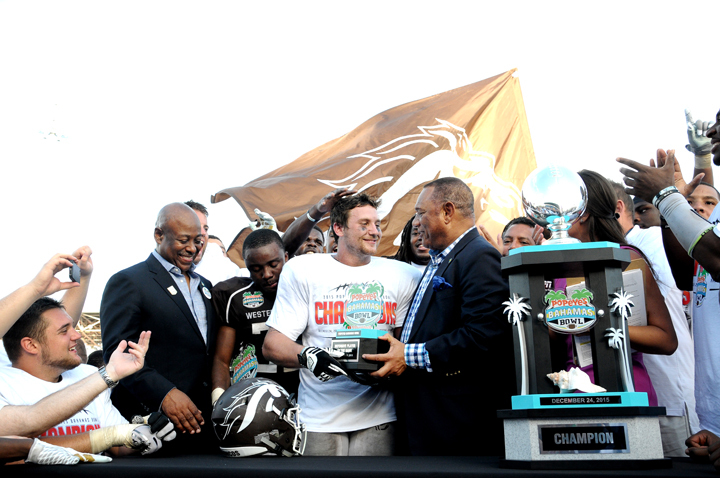 Last year, over 11 million homes tuned into the inaugural Popeye’s Bahamas Bowl on ESPN. The year, the sports television powerhouse acquired the game to give The Bahamas even more exposure. Minister of Tourism the Hon. Obie Wilchcombe said the promotion that The Bahamas gets from the game is priceless. “I’m really happy about this event and I know it is only going to get better. The truth is this is priceless promotion. You can’t pay for this type of exposure and it priceless marketing for The Bahamas,” he said. Director General of Tourism Joy Jibrilu said Popeyes Bahamas Bowl is a great way to spend Christmas Eve. “I think we have started a new tradition in The Bahamas. I see fathers out with children just having great, wholesome fun and we had a fantastic game. What more could you ask for,” she said. Ms. Jibrilu also said the economic impact of the Bowl is tremendous. “We know that over 125 players come for each team and they bring their families. We filled more than a quarter of the stadium and we had buses running back and forth. It was just phenomenal. Many of the players have never been to The Bahamas before and many of players said they were ‘blessed and that this is a dream destination.’ So we have converted families, team members and we know they are coming back,” she said. Hundreds of visitors and Bahamians came for the thrilling four-hour game. Officials say over 13,123 tickets were distributed. Pre-game activities were also exciting with games like the football toss, BBQ competitions, a DJ, live music bands, a performance by famous Bahamian artist D’Mac and photo ops among other things. Kelly Philips of Ohio said she came to visit the Popeyes Bahamas Bowl because her daughter goes to West Michigan University. “She wanted to come down from the cold and mentioned that the football team was playing. I’ve never been to The Bahamas and so I thought it would be a great experience. I’ve had a great time. The weather is awesome, the people are friendly and the country is just so beautiful. I’m really glad that I came,” she said. Samuel Taylor, who lives in Tenessee came to support the Middle Tennessee Blue Raiders. “The team was playing awesome all season. I’ve been to most of the games because I am a fan. The Bahamas was a no-brainer. It’s a no-brainer for a good vacation. You’ve got the weather, the food and drinks and to top it off, you’re having a great football game,” he said. In addition to the electrifying game, football team members from both universities participated in a youth clinic for the Ranfurly Home Children. Tourism officials have signed on for Popeyes Bahamas Bowl to be held in The Bahamas over the next five years.